Three things Calbuzz cannot abide: 1) kicking someone when they’re down 2) taking cheap shots and, uh, … what’s the third one there? Let’s see … taking cheap shots, and let’s see … we can’t, the third one, we can’t … Sorry. Oops. Anyway, in the spirit of Faith, Hope and … uh, let’s see … you’ll get no piling on from us about Rick Perry’s disastrous Wednesday night debate performance, nor any stupid jokes about the Texas governor telling his kids bedtime stories about Papa Bear, Momma Bear and … Huey, Dewey and … the Two Musketeers. 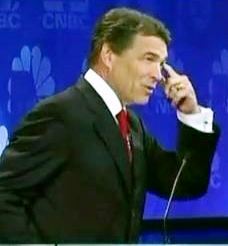 Oh sure, some may say, well, what about Rick Perry’s commitment to a government of the people, by the people and … the pursuit of life, liberty and … the truth, the whole truth and … the Father, the Son and … the Nina, the Pinta … and the Two Faces of Eve. But we are not among them. So don’t give us that stuff about small, medium and.. Wynken, Blinken and… two bags full. Because we hear no evil, see no evil. Ready, aim, on your mark, get set, strike two, you’re out. Veni, Vidi. And by the way, that was, uh, let’s see, “shooting at lifeboats,” the third thing we were reaching for a while ago. 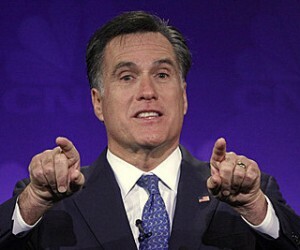 Battleground bushwah: We’re still scratching our heads about the answer Mitt Romney gave at the debate about the Obama Administration’s bailout of the auto industry in the depths of the economic collapse in 2009. Preaching to the choir, Mittens earned major hoorahs and huzzahs from a debate audience of a couple hundred Michigan Republican activists, but we can’t help but wonder how his laissez faire free market pandering, not to mention his relax-with-the-facts revisionism, played in the living rooms of the 1 million folks in and around Detroit whose jobs were saved by the federal loan program to General Motors and Chrysler. 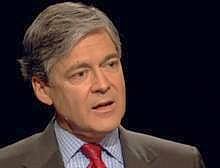 HARWOOD: Governor Romney, I want to switch to the bailout drama that we lived through in this country, and no state understands it better than the state of Michigan. I’m going to talk a little bit about your record on that. With a record like that of seeming to be on all sides of the issue, why should Republicans be confident in the steadiness of your economic leadership? ROMNEY: John, I care about this state and about auto industry like — I guess like no one else on this stage, having been born and raised here and watched my parents make their life here. I was here in the 1950s and 1960s when Detroit and Michigan was the pride of the nation. I have seen this industry and I’ve seen this state go through tough times. And my view some years ago was that the federal government, by putting in place CAFÉ requirements that helped foreign automobiles gain market share in the U.S., was hurting Detroit. And so I said, “where is Washington?” They are not doing the job they ought to be doing. My view with regards to the bailout was that, whether it was by President Bush or by President Obama, it was the wrong way to go. I said from the very beginning they should go through a managed bankruptcy process, a private bankruptcy process. We have capital markets and bankruptcy, it works in the U.S. The idea of billions of dollars being wasted initially then finally they adopted the managed bankruptcy, I was among others that said we ought to do that. And then after that, they gave the company to the UAW. 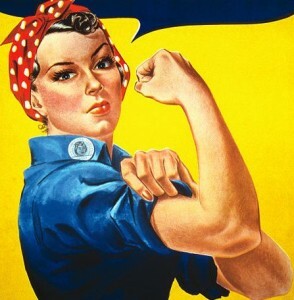 They gave General Motors to the UAW and they gave Chrysler to Fiat. My plan, we would have had a private sector bailout with the private sector restructuring and bankruptcy with the private sector guiding the direction as opposed to what we had with government playing its heavy hand. As the ubiquitous Chris Cillizza described in a clip-and-save summary of 2012 electoral college calculus, Michigan is a must-hold state for Obama for almost any scenario that gets him to 270. No surprise then that the Democratic National Committee rushed out a post-debate web ad hammering Romney’s answer, which includes references to his now-famous “Let Detroit go bankrupt” NYT op-ed. 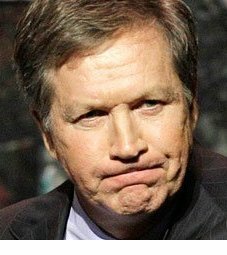 Add Rust Belt: Labor’s big win in Ohio on Tuesday night, overturning Republican John Kasich’s measure to eliminate the collective bargaining rights of public employees, clearly signals that the perennially crucial, perennial swing state is very winnable for Obama, despite his lousy approval ratings there. The latest Quinnipiac Swing State Poll reports a 50-44% disapprove/approve rating for Obama in the Buckeye State, but also shows him running ahead of Romney, within the margin of error, 45-42%, while the Democratic-tilted Public Policy Polling survey has him nine points ahead of Romney, 50-to-41%. P.S. Chris Reed over at America’s Finest, who tried to goad us into putting our money behind our key boards by betting on the Obama re-elect (we declined for reasons of, sniff, professional probity) may want to get in touch with Red State’s Erick Erickson, a shining beacon of conservatism who also seems to be giving the points and taking the incumbent. 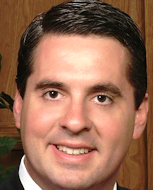 Mush from the wimp: The biggest crash-and-burn trial balloon in recent memory was the short-lived effort by Visalia GOP congressman Devin Nunes to float himself as the great Republican dope hope of taking down Senator Difi. It’s the kind of behavior you would expect of someone preparing to challenge the veteran senator in 2012. And Nunes, after being coy about the question for weeks, says he is now giving it serious thought. Within a few hours, sadly, Balloon Boy trotted out a minion to explain what Mr. Nunes meant to say, skinning back on any Senatorial aspirations in an interview with Michael Doyle, the Sacbee’s man in Washington. In future (sic) I hope your remarks will be tempered with recognition of the serious damage you and your Agency have done to this country. Starving people and communities of water, whatever the cause, is wrong. It is reminiscent of the actions of brutal dictators such as Robert Mugabe and Saddam Hussein who used water as a weapon against their own populations. Sigh. Now we’re left with nothing but the infernal reasonableness of Orly Taitz. 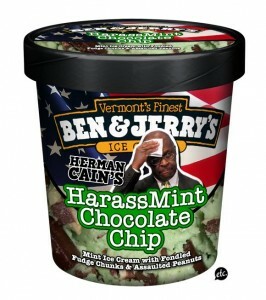 ICYMI: Since the Herman Cain sexual harassment scandal broke, Silver Fox Hank Plante has been indefatigable, sleeplessly staying at his computer to ensure that no one in the internets universe missed a single joke about the pizza buffoon. H/t to Hank for the adjacent. After arguing last week that labor would be crazy to fight Gov. Jerry Brown’s proposals for pension reform, we invited Steve Maviglio, consultant to the union-backed Californians for Retirement Security, to respond to our brilliant, well-reasoned and responsible points. Here’s his offering. At first glance, Gov. Jerry Brown’s 12-point package of pension reforms, released last week, looked like a deft political play, even winning over the usually sharp Calbuzz pundits. It won gushing support from editorial writers across the spectrum. The Wall Street Journal equated it with Nixon going to China. Goo-goo government types from California Forward and Think Long praised it. And predictably, it was trashed by labor on the left as too strong and bashed by the uber-right as not going far enough. But for the long haul, Brown may have negotiated against himself. His new set of proposals goes beyond those that Senate Republicans wanted this past spring in exchange for budget votes. So count on this: if Brown’s ambiguous measures are modified by the Legislature (and even the LAO’s tightwads suggested alternations yesterday), then the ever-cranky GOP will have an excuse to withdraw their support. Brown will have left himself open to criticism that he’s caved, meanwhile seriously harming his relationship with his labor allies. If anything, Brown could learn a thing or two from President Barack Obama on this score. Obama, after playing touchy-feeling with Congressional Republicans on a Grand Bargain, is now struggling to fortify his base. Similarly, with his pension package, Brown has decided to risk alienating his base while getting nothing in return from his political enemies. Indeed, state Senate Republicans will hold a press conference today calling for a special session of the Legislature to tackle the issue of pension envy. Just one example of how potent an issue this has become: the clamoring by Republicans is the reverse of their position two years ago, when now-Senate GOP leader Bob Dutton was among the bulk of Republicans in his caucus who voted against a modest labor-supported measure reducing pension liability. 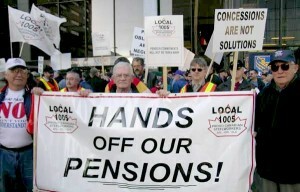 Nobody will dispute that labor has a fight on its hands to protect retirement security for the state’s public workers from assaults. The latest PPIC and Field polls show strong bipartisan support to rein in pension benefits among all demographic groups — even among public employees themselves. No wonder. Not a day goes by without a screaming headline about pension abuses. Publishing databases of public workers pensions become a goldmine to drive up click rates for newspaper websites. 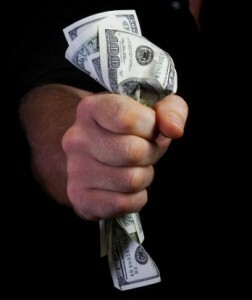 The “$100,000 Club” — representing less than two percent of the state’s retirees — secures about 98% of media coverage. Which leaves Brown’s triangulation-happy advisers hoping that labor will simply cave on the issue, give the governor a pass and then hop on board any measures he’ll propose for the November ballot that he views as more important to unions and the Democratic agenda. Central to this reasoning is their reckoning that labor won’t risk a ballot measure that goes even further than what the governor has proposed. They liken this strategy to 2004 workers comp reforms. As Capitol observers can recall, the Legislature buckled under Gov. Schwarzenegger’s threat of a ballot measure that year that would have been stricter than what labor was able to negotiate. The Democratic legislature grudgingly passed modest tweaks to the state’s worker comp system, averting the ballot initiative. But let’s take a walk down memory lane. In 2004, the ballot initiative proposal threat had a champion in a newly-elected popular governor. 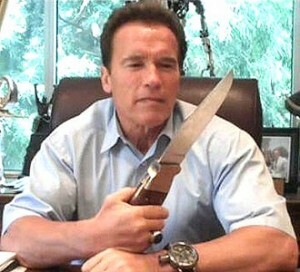 Schwarzenegger made it his signature issue, stumping up and down the state. There were big bucks behind it, including the full weight of the California Chamber of Commerce. Moderate Dems, under pressure from their own small business allies, didn’t need much convincing to go along with reforms. After all, not a single constituent would likely complain: the changes being proposed wouldn’t have affected the current benefits of a single worker, only impacting future claims. Compare that to the pension proposals, which will affect millions of Californians with a vested interest in their defeat. Hell hath no fury like a voter who will see his paycheck slashed and retirement put in jeopardy or voters who might be concerned if when they call 9-1-1, that their call is responded to by a 67 year old police officer. None of the six measures filed thus far reflect Brown’s plan. All of them are more extreme. And the governor didn’t seem too excited about going to the ballot. Clearly, he has bigger fish to fry. Only one of the measures appears to be semi-serious. Announced last week, it has the backing of former GOP Chairman Duf Sundheim and two Capitol insiders, former Schwarzenegger Finance Director Mike Genest and Dan Pellissier, a former aide to Republican Assemblyman Keith Richman. We’ll keep that one handy in our op research file. On their press conference call last week, the three admitted they’ve raised just $250,000 in the six months they’ve been working on their proposals. And while it’s clearly sympathetic to the union-bashing cause of pension busters, business has zero interest in backing their campaign. 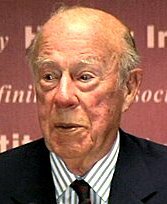 Former Secretary of State George Shultz was trotted out to provide stature to the effort (as he was in a press release for a paycheck deception measure a few weeks earlier). Unlike his starring role in Prop 23, where he wasn’t one of the usual suspects supporting action on climate change, Shultz is just another labor-unfriendly Republican whose stature is unlikely to attract dollars. The Republicans behind this measure seem to be hitching their wagon to a Sugar Daddy in Texan John Arnold, ranked #212 on Fortune’s 2010 list of world billionaires with a net worth of $400 billion. Aside from the fact that Californians have had a long history of rejecting ballot measures financed from Texas interests (e.g. : Valero’s ill-fated Prop 23 last year, T. Boone Pickens’s Prop 10 in 2008), it would be difficult to imagine a more delicious target for a campaign than a hedge fund billionaire from Texas who made a killing screwing Californians by making billions at Enron. Particularly on a Democratic-leaning November 2012 ballot. There’s a sense that Mr. Arnold is too smart a businessman to pour millions into an effort affiliated with the Three Stooges of pension reform. And fortunately, there’s a gap of about $25 million in campaign contributions between the GOP’s sloppy pension ideas and a voter-approved constitutional provision. So what should labor do? Find the third way, charting a course between head-in-the-sand obstruction and rolling over to the governor’s wishes. So far, unions have avoided the ostrich strategy and are engaged in constructive, money-saving reforms. As a result of concessions made at the bargaining table over the past two years, current state employees, as well as new hires, already have agreed to pay more toward their pensions. At the local level, at least 200 California cities, counties and local districts, firefighters, police, and other public employees have agreed to increase employee pension contributions and lower public costs. These aren’t token giveaways. They include firefighters, police officers, clerks, traffic workers and many more agreeing to pay more toward their retirements, adding new pension tiers and reducing pension formulas. They include vastly reduced pension benefits for new hires – a move that unfortunately will reduce cities abilities to recruit the best and brightest to protect and serve the public. Given everything unions have done so far and their willingness to negotiate further, labor would be nuts to roll over and play dead for Gov. Brown. Steve Maviglio is principal at Forza Communications and a consultant to Californians for Retirement Security. *”As a gubernatorial appointee, I resigned from the California Environmental Protection Agency on 1/3/11 at the change in Administrations. I was not fired,” Pellissier informed Calbuzz today.